Digitization is revolutionizing the economy and is playing a key role in the success of IT business sectors. This digital transformation process will depend crucially on the ‘Internet of Things’. The interaction between user, physical objects, data and processes will soon be more relevant than ever before. 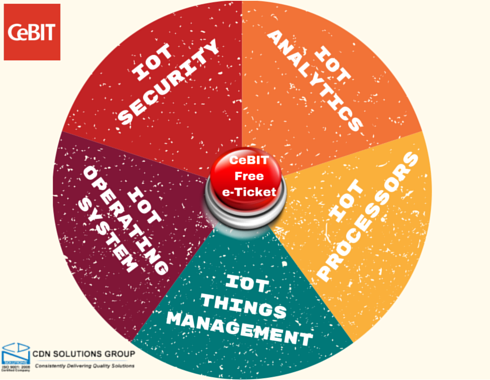 And CeBIT 2016 will this year focus on Internet of things solutions as well. We have developed many innovative Internet of Things solutions to contribute in next generation technologies. As an IT software and service provider company, we believe that innovations and new ideas are the only key that can help you unlock the unique opportunities for your business. You can find CDN Software Solutions in CeBIT Hannover, talking about IoT Solutions. Internet of Things Security (IoT Security): – The Internet of Things already introduces about new security risks and challenges to the IoT devices, operating systems and their platforms, their communication or even the system to which they are connected. Security technologies will be required to protect Internet of Things devices and platform from physical tempering and informational attacks. IoT security technology will protect the encryption of communication between the things and the user. So IoT security will be the next innovative creation to achieve success in the Internet of Things era. Internet of Things Analytics (IoT Analytics): – To understand the customer behavior, to improve products, to deliver services, and to identify and analytic the business services, Internet of Things demand new IoT analytic approaches. So for all these activities, IoT analytics technology is required in the coming years. IoT Things (Device) Management: – Long lived devices or things require monitoring and management. This technology includes software updates, thing monitoring, crash analysis & reporting, diagnostics, security management and physical management. For all these things management solutions, IoT device management technology is needed. IoT Processors: – The processors used by IoT devices has to be define many capabilities, such as strong security and encryption, sophisticated enough to support an operating system, updatable firmware, power consumption, embedded device management, etc. So for all that features specially configured IoT processors are required. IoT Specific Operating System: – Traditional operating system, such as windows, Linux, IoS are not designed for IoT purposes. To fulfill IoT application requirement, we require fast processors, real time responses, consumes less power, and many things in the operating system. So to fulfill all the IoT specific requirement, the IoT operation system is required. So for closely connecting with the great Internet of Things, we require all these technologies. We at CDN Software Solutions have developed many innovative IoT software and solutions for production and manufacturing, agriculture, automobiles. We are one of the exhibiting company in the global conference CeBIT 2016 – Hannover. We are a regular follower of CeBIT from the last 5 consecutive years not just for business purposes, but to learn and know about the new technologies and innovative solutions. This year, we are again participating in CeBIT with the same motive .You can also meet us regarding your business requirement at Stand no C 36, Hall 2 from 14 – 18 March, 2016 at Hannover Exhibition Grounds, Hannover, Germany. Contact us here to schedule a meeting right now. We are also offering free e-invite for visiting CeBIT Hannover 2016. Book an appointment now for getting it..! Celebrating 16 Glorious Years of Success. We Dare to be Different..!